About "A Beauty Refined (#02 in Sapphire Brides Series)"
Customer Reviews For "A Beauty Refined (#02 in Sapphire Brides Series)"
An interesting list of characters embroiled in a suspenseful fiction work by this great author. Unexpected twists and turns! 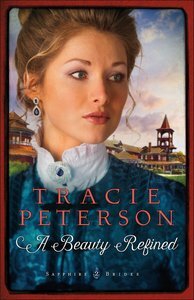 I'm really enjoying the Sapphire Brides series; Tracie Peterson has written a great sequel to her first book. The Von Bergen family story is heart breaking but then so is the main male character too. Ian Harper is someone every mother would want their daughter to meet. The light suspense is great and appealed to me. The secrets told are worth turning the pages for. I hope you'll enjoy it as much as I have.